The St. Louis Intercollegiate Athletic Conference has announced the members of their 2019 Hall of Fame Class. This year's class of inductees includes former Gorloks as two of the three members. The league has selected former Webster women's basketball star Angie Carr (2001-05) and former Webster men's soccer coach Marty Todt (1988-12) for induction. This years inductees will be honored during the league's annual Awards Banquet, which is scheduled for May 14 at the Tapawingo National Golf Club in Sunset Hills, Mo. A summary for each Webster inductee appears below, with more on the 2019 Hall of Fame Class in this Athletics release. Carr earns her spot in the SLIAC Hall of Fame after being a standout member of the Webster women's basketball program from 2001-05. In her career as a Gorlok, Carr, who is from Springfield, Mo., and graduated from Parkview High School, is the school's all-time leading scorer (1,658 points) and is fourth all-time in career scoring in SLIAC history. Additionally, she also hold the school's all-time record for field goals made (620), field goals attempted (1,231) and is second in career scoring average (16.3 ppg), career field goal percentage (50.4 percent), career free throws made (373), career rebounds (749) and third on the school's all-time list in steals (196), minutes played (2,674) and fourth in career free throw percentage (73.3 percent). In her time at Webster, Carr was a three-time First-Team All-SLIAC selection and was named the league's Player of the Year as a senior in 2004-05. That same year, she was also named an Honorable Mention Division III News All-American, one of just three women's basketball All-Americans in school history and was also the SLIAC Tournament MVP in 2005 as she led the Gorloks to the tournament title. As a senior in 2004-05, Carr led the league in scoring as she averaged 18.6 points and also averaged 6.6 rebounds per game. Led Webster to two NCAA Tournament appearances, including being a key reserve on the school's 2001-02 squad that won a school record 25 games and advanced to the Sweet 16 of the NCAA Division III Tournament. Scored over 300 points in each of her final three seasons, including leading the league in scoring in both 2002-03 and 2004-05 and is one of just two Webster women's basketball players to score over 1,000 points and record over 700 rebounds in a career. Helped lead the Gorloks women's basketball to an overall record of 74-35 and a 46-10 mark in SLIAC play. In 2012, Carr, who will be come the third member of that 2001-02 Webster team to be enshrined into the SLIAC Hall of Fame, was inducted into Webster's Athletics Hall of Fame. "This a great and very deserving honor for Angie. She has set the standard for Webster women's basketball as she is the all-time leader in scoring and second in rebounding," Webster women's basketball coach Jordan Olufson said. "All the alumni that come around, talk about Angie and how she was a true competitor and a very tough player." Todt earns his spot in the SLIAC Hall of Fame after serving as Webster's men's soccer coach for 25 years from 1988-2012. During his time with the Gorloks, Todt led Webster to five regular season SLIAC titles and four SLIAC Tournament championships. He finished his Gorlok career with a program-record 238 wins, including a school record 16 victories during the 1999 season. Todt recorded a career record of 238-189-50 at Webster and was 123-66-21 in the SLIAC. When he retired from coaching in 2012, Todt ranked 44th on the NCAA active coaching wins list. In his time at Webster, Todt, who is a 1992 graduate of Webster, led the Gorloks to 14 winning seasons and he earned six SLIAC Coach of the Year honors. He led Webster to five NCAA Tournament appearances, including advancing to the second round of the 2005 NCAA Division III Tournament. Webster also advanced to 17 SLIAC Tournaments in Todt's 25 years and posted a 16-12 record in the tournament and won tournament titles in 1995, 2005, 2009 and 2012. Coached six student-athletes that have been inducted into the Webster Athletics Hall of Fame with two of those athletes also have been inducted into the SLIAC Hall of Fame - Jeff Reis (2007) and Pat McSheehy (2009). Was inducted into the St. Louis Soccer Hall of Famer in 2011 and was inducted into Webster's Athletics Hall of Fame in 2012. "Marty was a beloved mentor and coach respected by everyone and this is truly an outstanding and much deserved honor," Webster head women's soccer coach Luigi Scire said. Scire served as an assistant coach with Todt on the men's soccer team until 1999 when Webster began the women's soccer program. 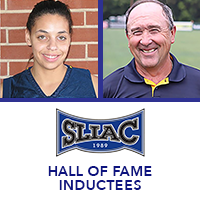 Carr and Todt are the 10th and 11th members with Webster ties to be inducted in the SLIAC Hall of Fame. Since the SLIAC Hall of Fame was reinstated in 2007, Webster has had a total of nine inductees, including five inductees since 2017 as they had two inducted in 2017, one inducted in 2018 and two this year.